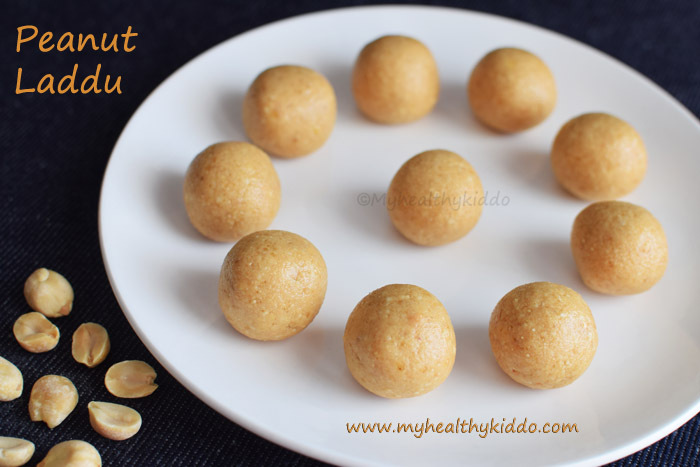 Peanut jaggery laddoo/Peanut laddoo using jaggery is a protein & iron rich snack. Posting this healthy sweet to mark the occasion of my website relaunch 🙂 New design & new look with lots of new hope 🙂 Click Home to witness the new ‘look and feel’ of the website & share your valuable feedback. 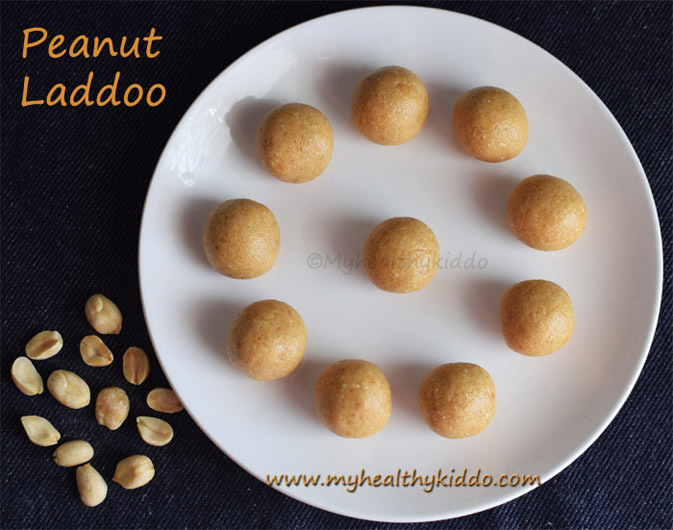 There is a small story behind this Peanut laddoo.. My friend Mrs.Suganya Vignesh tried my recipe of Peanut balls, but somehow she flopped it and without wasting the mix, she cooled down, ground it, made ladoos and sent me. It was delicious and when I asked her the recipe, she narrated this story 🙂 Then I tried it by officially flopping and am so glad for the output. From then, this has become my personal favorite and believe me that I have made this 50+ times after that 🙂 I have more followers for this peanut laddoo even before publishing it here.. If you are much concerned like me in filtering the jaggery syrup, then this is the best method to make laddoos with more shelf life.. I have tried many other laddoo varieties in this method and they are lined up for other occasions to be published here. Do try this and just love it ! Take ⅓ cup of grated jaggery. Add ⅓ cup water and a generous pinch of cardamom powder. Let it boil so that jaggery dissolves completely. Strain the syrup for impurities. Add filtered jaggery syrup to a kadaai and let it boil well. In a bowl of water, add few drops to check the consistency of syrup. You should be able to gather the drops to a mass and roll it into a soft ball. If this consistency is reached, simmer and add roasted peanuts to the syrup. Mix well so that all syrup are coated well. Keep a ghee-greased plate ready by the side. Transfer the contents to the greased plate. Remove the peanuts stuck to the ladle with a spoon. Spread and try to break any long bunches. Once cooled, immediately transfer to mixer in batches and grind it slightly coarse(without any bits, though). Do not pulse it for a long stretch. Check for every 2 pulses. Take off any peanuts that stand still without grinding and put it in the next batch. In the last batch, if 1 or 2 peanuts do not grind, just eat it 😉 Else, too much grinding will make the rest of the peanuts so sticky ! Take some and just roll the ladoo(not tightly) between your palms for perfect shape ! Store in air-tight container and enjoy for a week ! Add cardamom powder after filtering the syrup for rich flavor. 1.Take 1/3 cup of grated jaggery. Add 1/3 cup water and a generous pinch of cardamom powder. 2.Let it boil so that jaggery dissolves completely. Strain the syrup for impurities. 3.Add filtered jaggery syrup to a kadaai and let it boil well. In a bowl of water, add few drops to check the consistency of syrup. 4.You should be able to gather the drops to a mass and roll it into a soft ball. If this consistency is reached, simmer and add roasted peanuts to the syrup. 5.Mix well so that all syrup are coated well. Keep a ghee-greased plate ready by the side. 6.Transfer the contents to the greased plate. Remove the peanuts stuck to the ladle with a spoon. Spread and try to break any long bunches. 7.Once cooled, immediately transfer to mixer in batches and grind it slightly coarse(without any bits, though). Do not pulse it for a long stretch. Check for every 2 pulses. Take off any peanuts that stand still without grinding and put it in the next batch. In the last batch, if 1 or 2 peanuts do not grind, just eat it 😉 Else, too much grinding will make the rest of the peanuts so sticky ! 8.Take some and just roll the ladoo(not tightly) between your palms for perfect shape ! 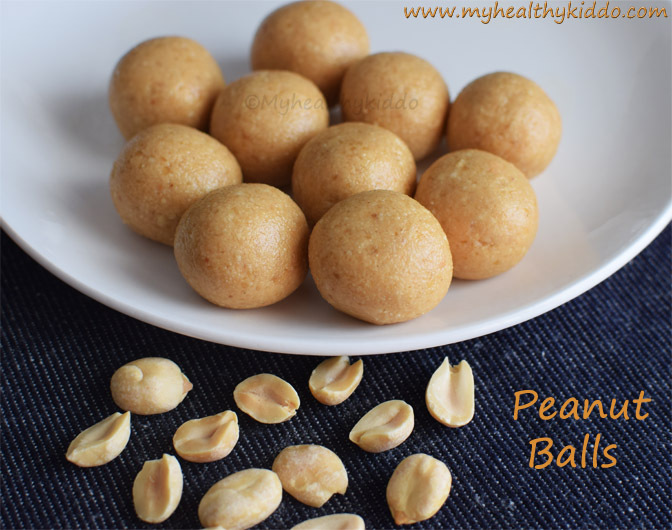 Store in air-tight container and enjoy yummy Peanut laddoos for a week ! Soft ball consistency is preferred for jaggery. But, no issues if it goes to hard ball. Make sure, there are no big bunches(separate it, if any) while cooling down the mix. Grind as soon as the mix is cooled down.. Else it might be hard to grind. Do not grind so smooth as it might stick in the mouth. 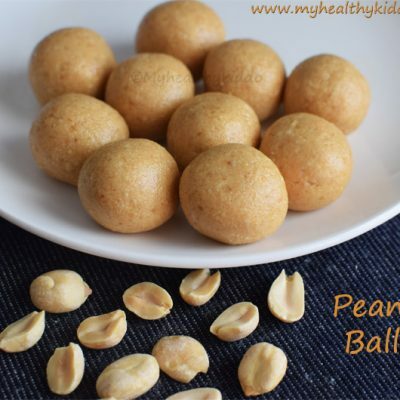 For perfect peanut laddoo, do not roll it so tight. First make a roundel and then gently roll each laddoo between your palms for the perfect finishing..